Are you looking to buy or lease a new or used hydro-vac, combo-vac or straight-vac truck for your oilfield, septic, excavating or construction company in Pennsylvania? Buying a hydro vac or straight vac truck for your company isn’t a small decision. With these trucks easily costing $100,000 – $500,000 or more for the more equipped trucks they are incredibly large investments for most contractors to make. If you own or manage a busy company in Pennsylvania with enough clientèle to keep a hydro-vac truck or several of them busy then you already know the potential revenue these trucks can generate. Name any type of construction or excavation industry in Pennsylvania and we’ll be able to show you hydro vac truck solutions that will be able to make your job easier and more efficient. 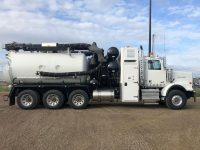 From sewage hauling to oilfield services to road construction and excavation we can work with you to come up with a vac truck solution specifically tailored to the type of projects your trucks will be working on the most.